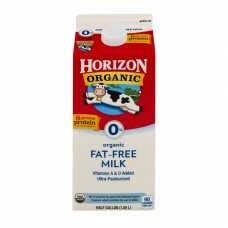 Horizon® Organic 0% Organic Fat-Free Milk. 8 grams protein in every 8 oz glass. Vitamins A & D added ultra-pasteurized. USDA organic. We're proud to be part of the National Organic Program, which prohibits the use of GMOs. 90 calories per cup. Half gallon (1.89 L). Our promise to you. Bringing our best to your table. We know how much you care about feeding your family because we're parents too. That's why we support the organic movement and keep our foods as wholesome as they are delicious. We're proud to be part of the National Organic Program, which prohibits the use of GMOs. We raise our cows kindly and don't use growth hormones* or antibiotics. We steer clear of artificial colors, flavors and preservatives. *No significant difference has been shown between milk from rBST-treated and non rBST-treated cows. horizonorganic.com. Calling all busy families! We've got you covered with good foods kids love. Count on Horizon® as part of a get-'em-ready breakfast, a quick-and-easy dinner and the lunchbox in between. We always do our best to choose simple, recognizable ingredients so you can feel great about bringing us home. Organic Horizon, sandwich crackers, cheddar. Horizon organic, sticks organic mozzarella. Organic Horizon, organic mac. Organic Horizon, organic fruit snacks. Horizon organic, chocolate. Look for our growing family throughout the store. We love our farmers: We're proud to work with farm families all around the country to bring you delicious organic milk. From sunny California to the rolling hills of New York, local family farmers are the heart of Horizon. Grade A. Certified organic by Quality Assurance International. We'd love to hear from you! 1-888-494-3020 or visit horizonorganic.com. Recyclable. Facilities may not exist in your area. Visit our partners at recyclecarton.com. ©2014 WhiteWave Services, Inc.
Perishable. Keep refrigerated. Best if opened by sell-by date and used within 7 days.